Make your legacy at the Zoo! - Fill in the name/text exactly as you wish to have it engraved on your tile. - There are 12 letters and spaces on two lines, for a total of 24 letters and spaces. - Each tile is 6" high x 6" wide. - Tile color is Autumn slate, described as "a rainbow of warm and soft earth tone colors." 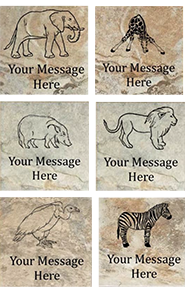 - Choose which animal for tile: elephant, giraffe, Red River hog, lion, vulture, zebra- Special characters (i.e. hearts) are an extra $15 each - call 719-424-7830 to include them. NOTE: Please leave the Quantity box below = 1, no matter how many tiles you are purchasing. Join in on the Tile Program and carve your memories in stone with your own personalized slate tile! 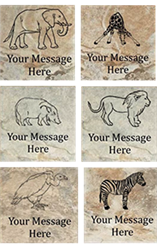 For only $150, you can personalize a slate tile for yourself, your family, a special friend or an organization important to you. Funds raised through this program directly support the Zoo. Tiles will be installed on the outside of the new elephant and rhino barn in Encounter Africa. Celebrate your child's Scout troop or third grade class! ** Special characters (i.e. hearts) are an extra $15 each to engrave. Please contact the membership department at 719-424-7815 to include the special character into your order and payment.